Olympia Little Theatre is physically located at 1925 Miller Avenue NE in beautiful Olympia, Washington. Please, do not send mail to the street address as it will be returned by the post office. How many shows are done each season? 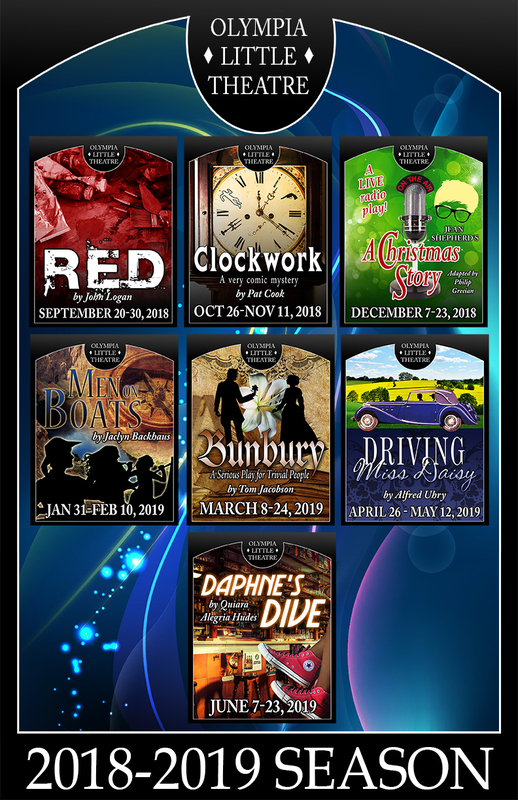 The number changes from year to year; however, there are seven regular productions scheduled for the 2018-2019 theater season. Thursday, Friday and Saturday shows begin promptly at 7:25pm, Sunday matinees begin at 1:55pm. Empty seats will be released to wait-listed patrons at this time. Doors open 45 minutes before the curtain time and complimentary coffee and tea is available in the lobby. Parking is available in our lot. How do I get your brochure? Why should I buy season tickets? When you buy season tickets, you save $2 per ticket! The savings really add up! Buying season tickets also saves time. You don’t have to drive to Yenney Music or pay the per ticket fee to buy online. As a season ticket holder, you are also able to exchange your tickets if you can’t attend on your chosen night. This is a courtesy we extend only to our season ticket holders. Please keep in mind that there may be an upgrade fee if you change your tickets to a more expensive performance. Exchanges may be done based on seating availability. Please call the OLT office manager to make your exchange at 360-786-9484. If leaving a message, please leave a detailed message including your name, phone number, your current show date, and the date you would like to exchange to. You call will be returned within 48 hours. You can purchase a gift certificate for one ticket or any combination or monetary value. Just click on the link below or give us a call at (360) 786-9484 and we’ll be happy to assist you! For just $10 a year, you can become a supporting member of Olympia Little Theatre. This donation helps OLT to continue to offer quality entertainment at an affordable price. As a member you also qualify for a $2 discount on all single ticket purchases. Click here to become a member! Yenney Music store sells tickets for the current show with no service charge. Checks and cash accepted. What is your ticket exchange/refund policy? As a small, volunteer based, non-profit theatre, we are unable to offer refunds or exchanges for ticket purchases to individual performances. Season ticket holders may request an exchange by calling the theater at least 48 hours in advance. Season ticket exchange requests are honored based on availability. What does it mean to Like us on Facebook? If you have a Facebook account, you can choose to ‘like’ certain pages. When you’re logged into your Facebook account, look at the top of your page. You will see a white search bar. If you type Olympia Little Theatre into that search bar, our page will come up in your list of options. Click on our organization. When you’re at Olympia Little Theatre’s page, click on the Like button at the top of the screen. This will make you a fan of our Facebook page, and you’ll see any updates we make posted on your wall! When are auditions for the shows? Auditions will generally be scheduled for the first Monday and Tuesday following the opening of the previous production. Please click here for the dates of the next auditions. If you are a fan on Facebook, you will receive event notices of upcoming auditions. Auditions are open to anyone interested in participating in an OLT production. For further information, please look at our plays and contact the director at the e-mail address listed within the audition info. I don't want to act. Can I work back stage? Of course you can! We can always use people to help with props, lighting, sound, costumes and stage management. Visit our “volunteer” tab for more information and a volunteer sign-up form. You can also call or email us for more information.